So. Here we are. The end. It's been a wonderful four months, and I can't help but be surprised it's over. I've done the yeard; in fact, I shaved off another one in November to kick this thing off. I want to try Moustache May this year, but I don't know if I'll get around to it. I don't know what I'm gonna do with my hair; I'm looking Jolie-circa-Hackers at this point, which is awkward to say the least. Most of all, I just don't know what I'm gonna do. There's something transcendent about this whole thing. Be it the masculine answer to bra-burning or just a simple expression of our inner wildman, we have, each and every one of us, freed ourselves. Now that it's over, there's gonna be a big beard-shaped hole in all our lives. First of all, thanks to @emsiizilla for all of your help; you've been the figure around which I've built myself for four years now, and it's been bliss. It's a shame we didn't get to do a "She said yes!" picture during Whisker'09, but the time and the money are simply not there. Second, thanks to @grapes for joining up this year and subsequently demolishing every expectation I might have had. You killed it, man. Good show. Thanks to @yogibeard, @folliclejuju, and @johnnyrebellious for daily support as well as daily awesomeness. You were the first three beards I followed, and you had some of my favorite shots of the entire run. Thanks to @mattyc for that epic GrapeS campaign. Also, for those two or three spineless robot jokes and for inadvertently naming an NPC in a D&D adventure. Thanks to @hale for countless cat CLAMEs in talkback. Emsii and I laughed for... well, cumulatively, I'm sure it was hours. Thanks to @greenlab for sharing your creative glass art and putting a new spin on old wisdom. Thanks to @9schwander, @zbolin, @steve-o, @zfa, @crambell, @brandonhill, @jar, and @mattyo for what turned out to be a most excellent Joplin meetup. You're all great, and it was a thrill to meet you. It also dampened the bite of not attending Throwdown, and for that, I thank you again. Thanks to @finnmaccool and @ferociouscupcake for that awesome CLAMEbute. That was a highlight of my Whiskerino, seriously. Finally, of course, thanks to @mackle. I can't even begin to fathom the amount of work that goes into this thing, and for reasons even my sudden long-windedness can't express, "this thing" is incredibly important to all of us. Thank you, thank you, thank you. I'm sure there are many more of you that should've been thanked, and for forgetting you, I am sorry. tl;dr: You guys are great, and I'm gonna miss this. If you're ever in Rogers, hit me up at facebook.com/gragaband/ or blackgregory@gmail.com. We can get some coffee and/or Thai food. It will be awesome when I see you in the real world. I think you forgot to thank me, but that's OK. CAT!! You and @emsiizilla are cute as hell. And have excellent taste in interiors. And cats. Just don't let her fatten you up too much with all that baking. If you are ever even near Knoxville or surrounding parts, look us up. Take care and tame that demon cat (and jolie hair). great shot. you and @emsiizilla killed it this year. A great ending! This pose OWNS! We'll look forward to the "She Said Yes" shot in future endeavors. It was a blast, wasn't it? You are my bearded knight in shining plaid armor; and I have been having fun on here non-stop since November 1st. It's been awesome following you on here. It's a shame we never met. I think we would get along well as would the ladies. Who knows what the future holds though. If you're ever in Atlanta let us know. You're welcome for the clamebute. so glad to do this with you again and to hang out with you guys this year! No, no sir. Thank YOU. Whoever was like me (20's, a nerd, and in college) was on my following list. Keep on rockin' in the free world. Also, that cat is a monster. @mattyc, what @grapes said. I love Louisiana. This is a hell of a photo to end a hell of a year. Your AR crew brought the serious awesome these four months, and we've dug all of it. Stay hairy and stay awesome! @grapes: Yeah, this is the most I've typed in four months. Thank you, @davidw and the lady in his picture, for wearing those awesome shirts. Thank you, @edwardteach. Specifically, for your header. Thank you, @growershower, for inspiring dedication and for writing a thank you as long as my own. @jnonfiction: Someday. And yeah, it really was. Thank you for remembering our '07 Lebowski. @finnmaccool: I'll see what I can do. @9schwander: Always a pleasure. It was great to meet the little one! @yogibeard: Wear it with pride, man. @mattyc: You can't take it back now. There's bound to be a trip to Louisiana in our future. Ending with a cat-pip? Awesome. Excellent work. You know, you can skip the engagement ring if you elope. Also you can get amazing rings from the 1800s at flea markets, etc for a fraction the cost. Check my wife's finger for the effectiveness. EPIC CAPTION! It wasn't tl;dr at all - I devoured every word. Your presence here has been extremely appreciated and I hope you know it. I would be totally bummed if you didn't try out Moustache May. We need you around there. Please? Do I have to beg or plead? What's needed to ensure this happens? I know I'm saying this on a lot of captions but it really has been a pleasure. I may not have actually ever met you but I consider you a friend; even if it is all Internet based. Take care gragaband.. you are good peoples. @gragaband, thank you! thank you for being here, for bringing @emsiizilla into the chat and representing team cat so well. 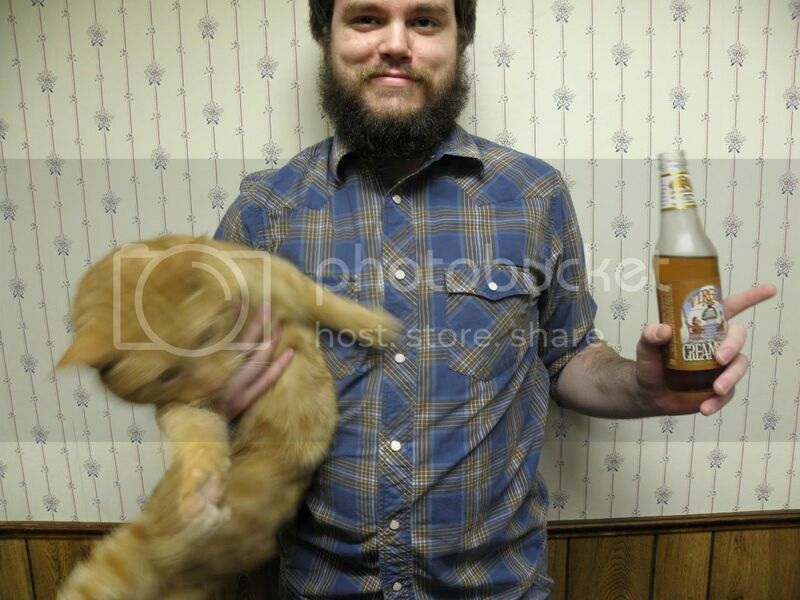 your photos always provide a healthy does of humor plus beard, cats, emsiizilla and cats. i'm tired and not making sense now. you're awesome. be well. @ozzynelson: Thank you for not being too hard on my comment ratio. It's loads better than '07. @wondermade: It's mostly the wedding that's going to cost us, but we're looking to bargain on that too. Thank you for the kind words and suggestions, though. @mackle: Thank you again, and have no fear; I will be there in May. If anything, emsii will simply not let me get away with skipping it. @hale: You are awesome as well. I'm glad emsii got such a kick out of chat. You are an internet celebrity to us both. @robberfly: The same to you. May you live a life as long and as happy as your beard. It was nice meeting you guys at the Joplin throwdown. Hope shooling goes well. Even though you sound quiet aimless in your comment, I know you will find your way. Congrats on your upcoming wedding. I was married less than a year ago, so I know exactly what must be going through your guy's minds. Keep strong. I just pulled out a funny looking bottle, trying to capture the essence of you and @emsiizilla, but I failed. Instead, I dreamed of the Thai food you spoke of, looked at the clock and the green numbers staring me in the face, then back at some salsa that rests near my elbow. Best to you in the future. I hope you get that Camero. so Good! IT was Great bearding it up with you! man, it was good to grow whiskers with you. hopefully we can see each other in person sometime soon. peace! 'Sup? I'm Andrew, and I'm an English major. This semester, I'm reading stacks of British novels and about twelve epics from across the globe. In my spare time I read more, and I occasionally play some video games--the only video game I play on a regular basis is Kingdom of Loathing. I like fine food (and trash-tastic food) and long walks (except for the "walks" part). I'm also known as gragaband, gb, or Errmal of the Deeps.